Problem Finding - ANGELA M. HOUSAND, PH.D.
​In searching for a problem, students need to seek out a problem or question that does not have an existing solution or a solution where there is only one right answer or unique solution. Keep in mind that the purpose of pursuing a problem is to bring about change or contribute something new to a domain or field of study. While this curriculum is very process focused, knowledge is foundational to any field, domain, or area of endeavor, therefore students must gain knowledge prior in order to successfully define a problem that will lead to a meaningful investigation, product, or performance. 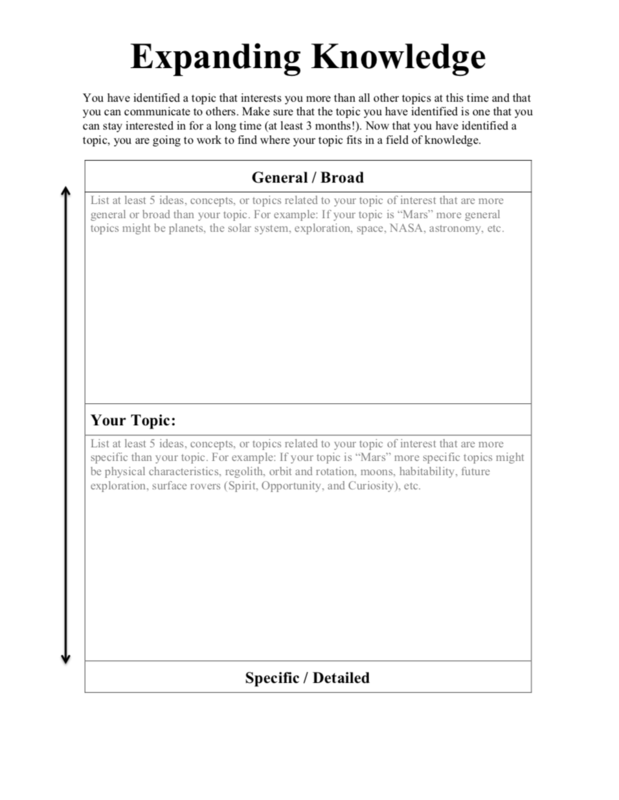 ​Using the Expanding Knowledge handout have students take their topic or the keyword from their topic and list 5 ideas or concepts that are more general but related to the topic or keyword. These should be listed above the main topic. Then, have students list 5 ideas or concepts that are more detailed or specific. These should actually be subsets or sub domains of the main topic. Five is a minimum, but students can list as many as they would like. Now that students have identified knowledge relevant to his or her topic of interest, it is time to identify the conflicts, challenges, problems, or needs that exist within the field of interest. 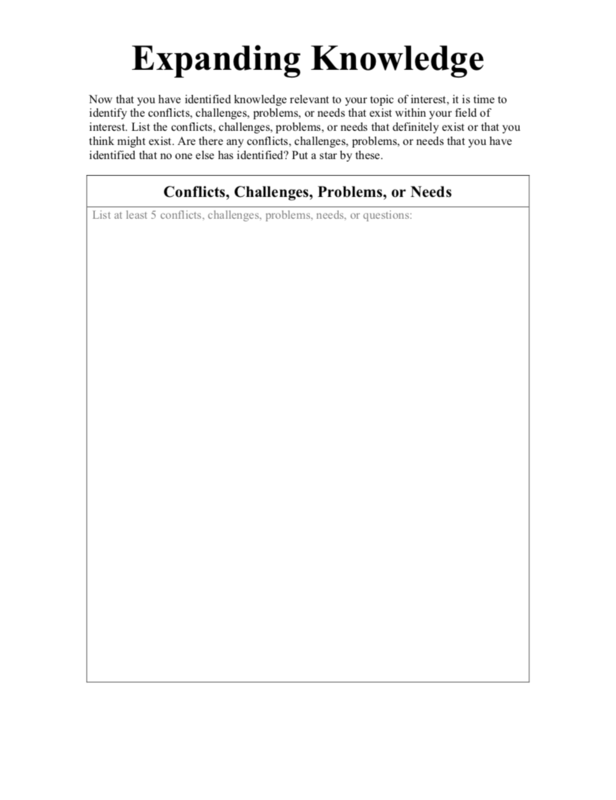 Students will list the conflicts, challenges, problems, or needs (CCFN) that definitely exist or that might exist. Are there any conflicts, challenges, problems, or needs that have been identified that no one else has identified? Put a star by these. 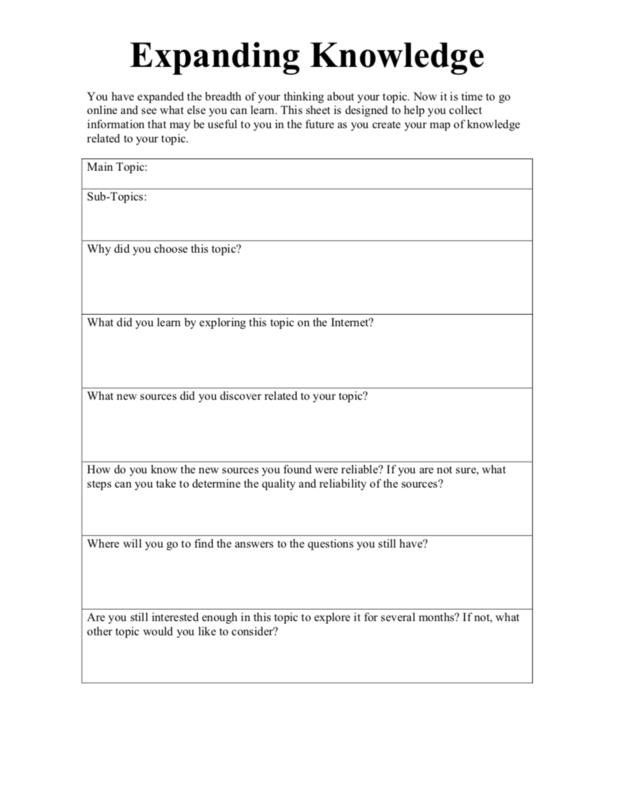 This next form is to ensure that students are thinking about their own questions in relation to the problems that exist within a field. Students should consider the questions they have about the topic of interest. 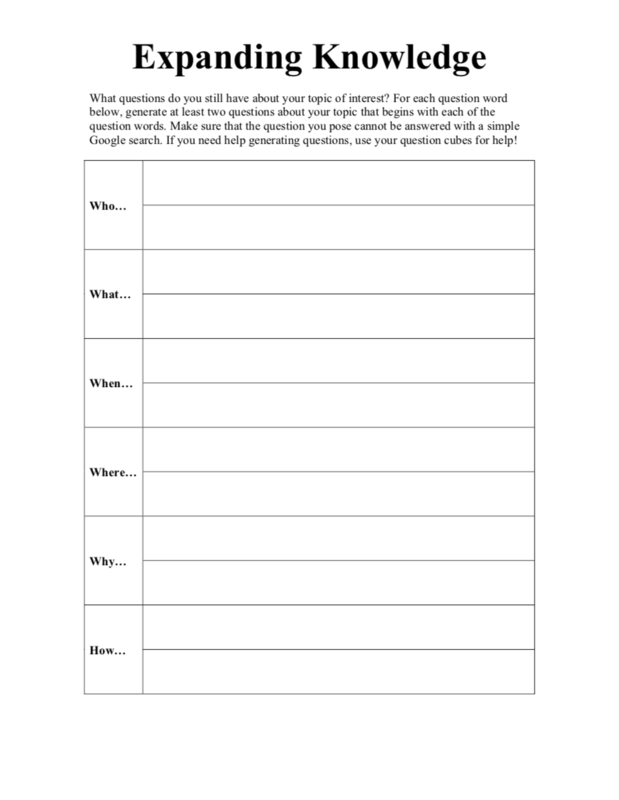 For each question word on the handout below, students should generate at least two questions about his or her topic that begins with each of the question words. Make sure that the questions posed cannot be answered with a simple Google search! Finally, students should have expanded the breadth understanding about his or her topic, however, the foundational knowledge is still unlikely sufficient for deep learning. This section serves as an opportunity to reflect and assess one's level of understanding as well as formalize what has been learned about the topic to this point.